Tonight sees the return of “The Great British Bake Off” on Channel 4 in the UK, so why not be a star baker and have a go at creating a gorgeous red velvet cake in your Blendtec? 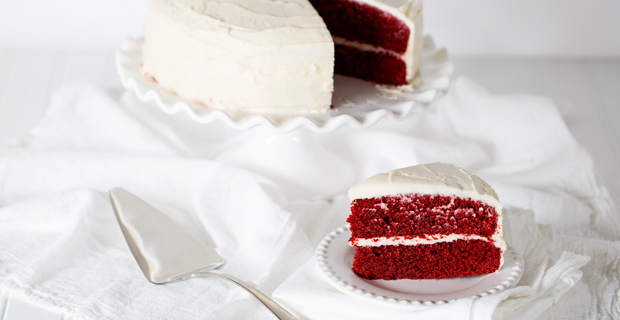 This dense, moist and velvety cake will leave everyone raving! Line two 8-inch round cake pans with parchment paper and spray with non-stick cooking spray. Add flour, cocoa, salt and baking soda to FourSide or WildSide+ jar and secure lid. Press “Pulse” 2-4 times to incorporate the ingredients. Dump into separate bowl and set aside. Add butter, oil, and sugar to jar and secure lid. Blend on a low speed for 20 seconds. Add eggs, buttermilk, vanilla, red food coloring and vinegar to jar and secure lid. Select “Batters” or blend at a medium-low speed for 30 seconds. Add half of the dry ingredients to jar and secure lid. Blend on a low speed for 5 seconds. Add remaining dry ingredients and secure lid. Blend on a low speed for 10-15 seconds or until dry ingredients are incorporated. Pour even amounts of cake batter into prepared cake pans and bake for 22-26 minutes. Allow to cool completely and prepare the icing. Cut off rounded top of one of the cakes and use that cake as the bottom layer. Using icing, spread 1/4-1/2 cup icing on bottom layer and stack the other cake on top to make two layers. Frost entire cake. Chill for at least 2 hours before serving. Add cheese and butter to FourSide or WildSide+ jar and secure lid. Blend on a low speed for 20 seconds. Add vanilla and 2 cups powdered sugar to jar and secure lid. Blend on a low speed until sugar is incorporated, about 20 seconds. Repeat with remaining powdered sugar. Spread icing over cake as desired or follow icing instructions in step 11 above.